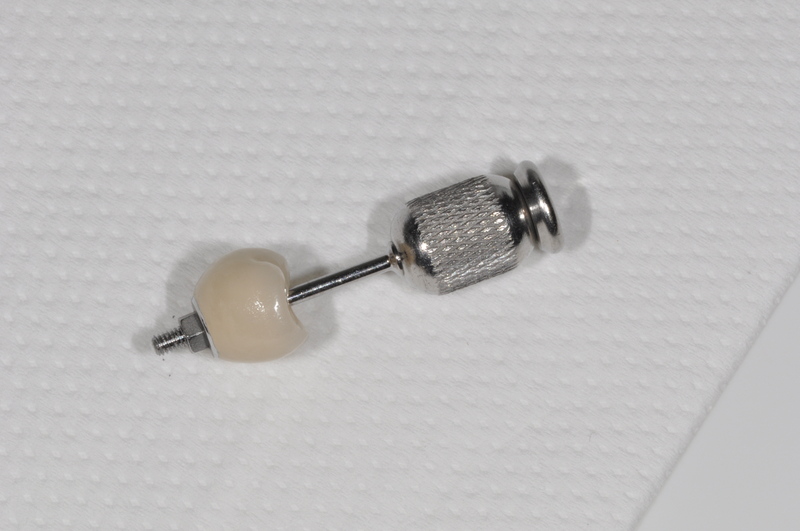 Once the implant has been placed and the area has healed, impressions are taken of the healed implant. The impressions are then sent to the implant dental laboratory and a crown is made. 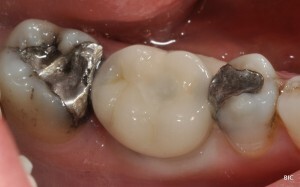 This type of crown is known as a screw retained crown. The crown has a small screw access hole in order to be able to remove it if necessary at any stage. The screw access hole is eventually closed with some tooth colored resin. 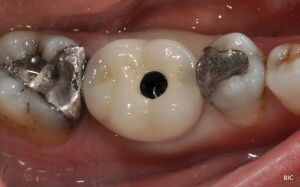 The screw retained crown just before being fitted in the mouth, one can see the access possible with the implant tool. In a screw retained crown there is also no cement holding the crown in position. This can be beneficial from the point of view that there is no chance of excess cement causing problems with the gum tissues. Once the screw retained implant crown is secured into position the adjacent teeth are adjusted if needed to accept the new crown. 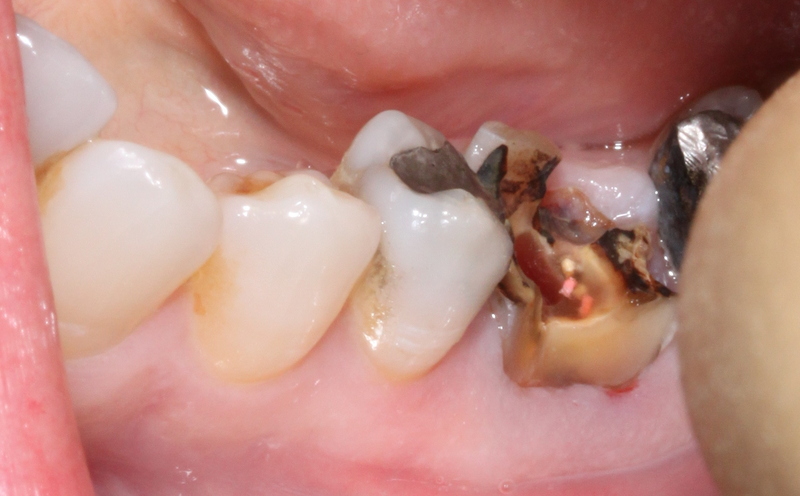 In this case the patient had no problems with the adjacent amalgam fillings and it was decided to leave them as they are. The small screw access hole is covered with tooth colored resin, the crown is adjusted if necessary to ensure that it is comfortable when biting and chewing. 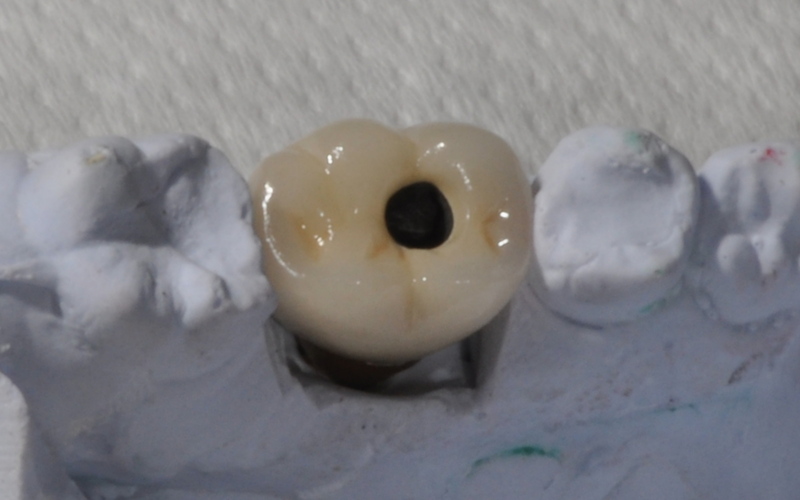 The screw retained crown is in position and ready to start working ! Contact Brighton Implant Clinic now if you have a broken molar, its simple just complete our contact form now or Call us on 0800 111 6623.